We have created a course and structure especially for mature aged learners. The Spanish for Seniors Course is specially designed for mature aged students over 50 who wish to; exercise their mind and spirit, perfect the Spanish language, and experience learning Spanish in a culturally rich environment. 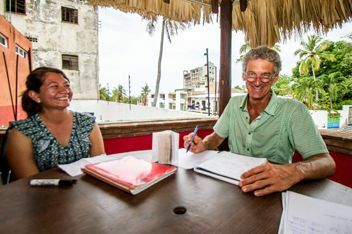 The primary and fundamental idea of this course is based on our mature aged students learning Spanish for pleasure, learning Spanish for knowledge, and experiencing the culture of Mexico in all its different forms of expression. At the same time we focus on strong communication skills so that our learners can get the most out of their course in a short time, and enjoy their experience from the first day to the last. Conscious of the challenge in memorising new vocabulary, you also take classes outside of the school grounds in different places of interest. These varying locations help our learners to contextualise vocabulary and themes, transforming the classes into an interactive discovery of the hidden places of Puerto Escondido, full of colours, flavours and smells. The role of the teacher in this course is as a guide and companion, as support in understanding the needs of learners, and as a provider of the necessary linguistic tools required to discover Mexico and its people. 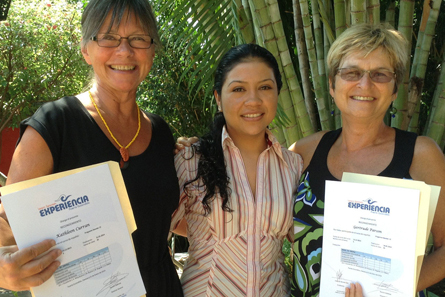 The Spanish for Seniors Course is also a interactive course. Puerto Escondido has a warm, dry days with cool nights and it is the optimum time to enjoy the town and the beach. More than the normal traditional holiday, our program provides our learners with the opportunity to get involved with local people, gain knowledge of local culture and traditions, and intimately access all that Mexico has to offer. Are you ready ? Got questions ? How can we help you ? Two lessons daily in communicative grammar. One lesson daily in practical conversation. Note: expenses not included in educational tours.